HRC Welcoming Schools Expert Trainers are located across the country. They offer practical and interactive professional development to create gender and LGBTQ inclusive schools using the following Welcoming Schools training modules. Contact Welcoming Schools to bring a training to your school or district. Learn how to develop LGBTQ inclusive classrooms and become familiar with LGBTQ terminology. Learn the importance of seeing and embracing family diversity. Be able to answer questions from students and families about the importance of welcoming all families in your school community. 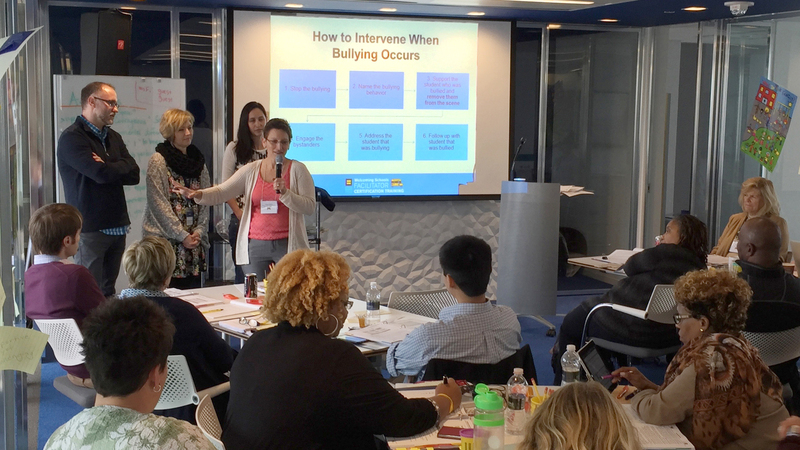 Understand the critical need to proactively address the biased behavior that can lead to bullying. Become familiar with language to strengthen current policy and advocate for enumerated protections for all students. Explore the concept of intersectionality and how to use it as a framework to create school climates that are affirming and welcoming for students’ whole selves, including intersectional identities such as race, ethnicity, gender, ability, faith, LGBTQ identity, family structure, etc. Understand the experiences and impact of school policies and practices on students’ intersectional identities.